We all know that Christmas decorations and certain foods pose hazards to our huskies. But did you know about these? 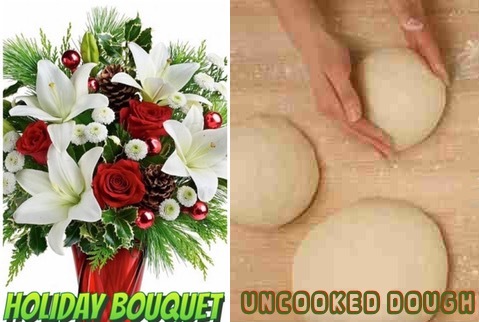 Holiday Bouquets: We all know that Poinsettia plants are mildly toxic. But far worse are lilies (Lilium spp), holly, or mistletoe. Lilies are one of the most commonly used in bouquets, (even the pollen and water that the plant is in are thought to be poisonous!) Holly berries and mistletoe can also be toxic to pets. Florists also use Japanese Yew (Taxus spp.) to make wreaths – all parts of this evergreen except for the flesh of the red aril are very poisonous. Keep your pets away from these flowers. Dough: Most people know not to give alcoholic drinks to their pets; however, alcohol poisoning in pets is more common than you think. This is because alcohol can be found in surprising places! Rum-soaked fruitcake, or unbaked dough that contains yeast, result in alcohol poisoning and other problems. Rising dough will expand in the warm, moist environment of the stomach and can result in a bloat. Secondly, alcohol from the fermenting yeast is rapidly absorbed into the bloodstream and affects pets quickly. Ingestion of alcohol can cause dangerous drops in blood sugar, blood pressure, and body temperature. Presents under the tree: Many gifts smell intriguing to these mischievous huskies. Lotion, scented candles, potpourri, leather! Even a normally well-behaved Sibe will start ripping open and chewing these packages. We suggest that only supervised visitation rights for your husky and tree.